Capitulative breadth now down to 6 on the rally in stocks, but still suggestive of some more upside for equities to properly neutralise it. Not all have been compelling turns but nonetheless shorting each new moon and going long on each full moon would so far have made a profit every time this year. Historically, lunar phasing has worked better in periods of sideways chop like this. Based purely on the moon, we could expect stocks to peak out again in mid-August. But at some point this price range will break one way or the other. 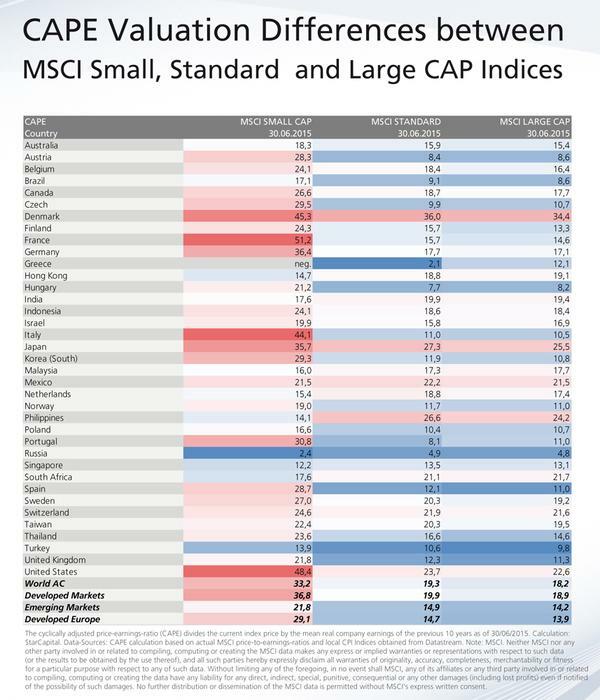 And US small caps are the most expensive they’ve ever been. 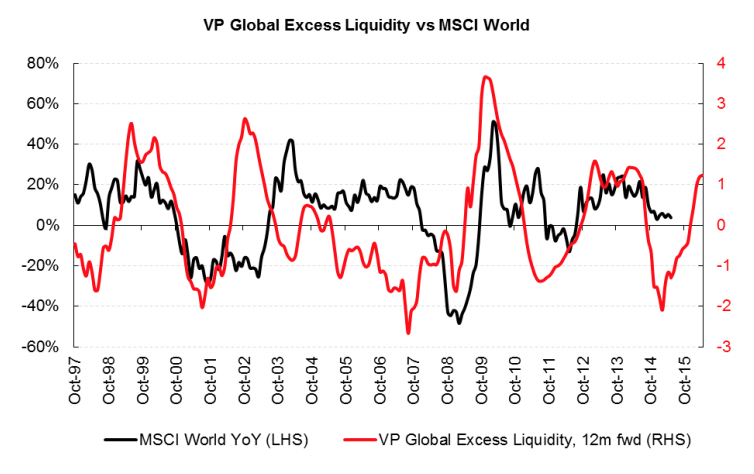 But whilst stocks continue to levitate the key question remains whether excesses in valuations, sentiment, allocations and leverage need to be reassessed in the context of ZIRP and QE, and don’t pose the same threat as typically historically. 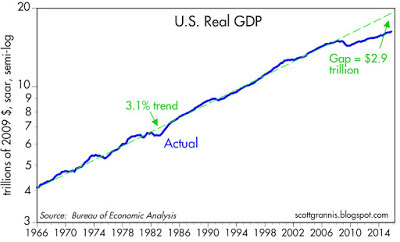 That analysis is further complicated by not having experienced this combination of negligible rates, low inflation, low growth and high debt for over half a century. 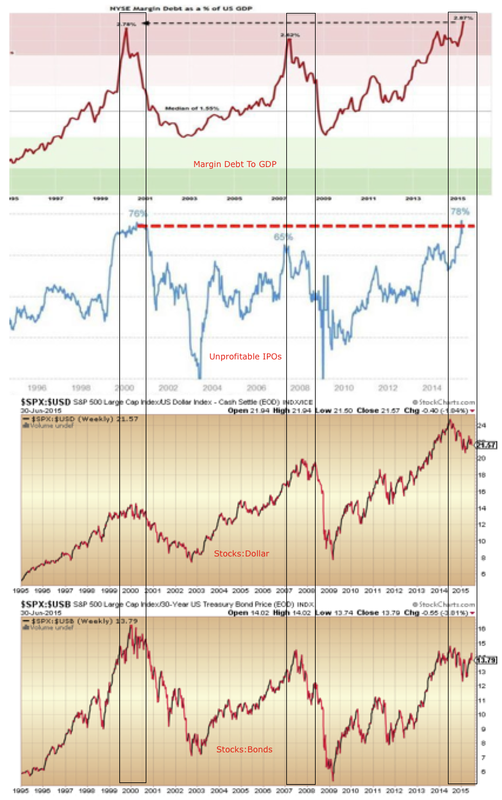 So, either (1) the stock market is majorly divorced from reality and reverting to mean soon, or (2) the economy finally picks up from here and catches up with stocks having led, or (3) this is a new norm skewed by central banks whereby current indicators of a top that resemble 2007, 2000 and others no longer apply. You know where I stand on this question, but the sideways price range of 2015 has yet to validate or invalidate any of the options. 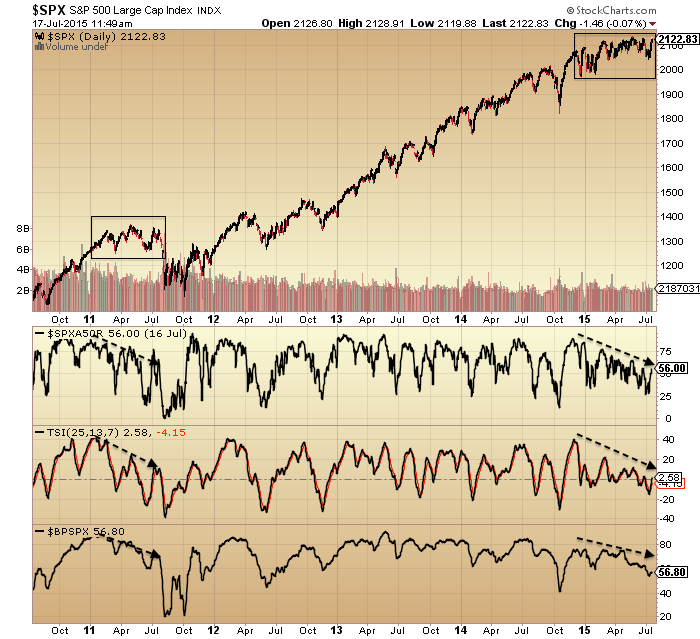 Leading indicators still largely point to a pick up now and towards the end of 2015. 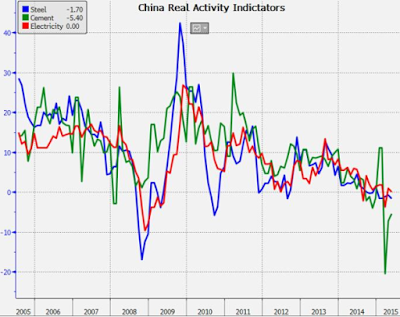 Whereas China looks to be in trouble. Biotech is also wobbling currently, testing the bottom of the parabolic. So are these the last gasps of a topping process? 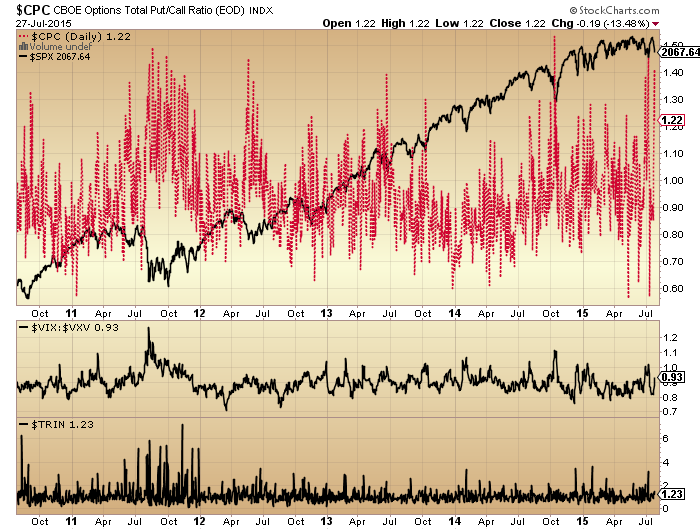 Or is the price range of 2015 in broad equities the pause that refreshes the bull? We saw some evidence of reset by the end of last week: AAII sentiment, bullish percent, capitulative breadth, put-call all suggestive of a significant low. 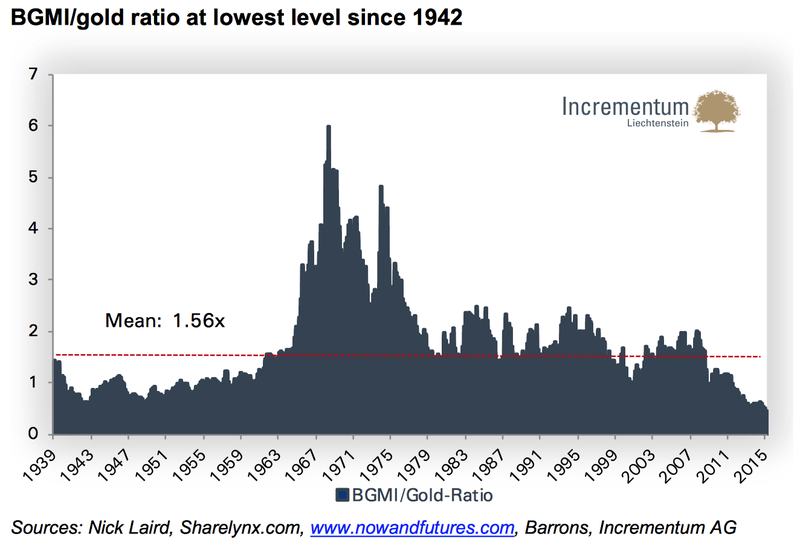 However, in the bigger picture historically, these look like a low in a bear market, i.e. from which a counter rally erupts before lower lows ahead. 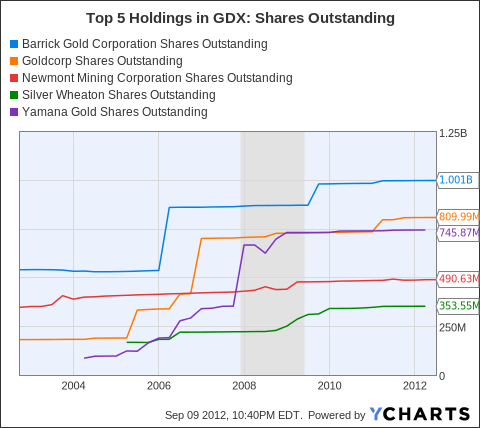 What’s confusing is their occurrence just 5% from the highs in nominal terms. Right now I expect stocks can move higher before they move lower again. So I am waiting and watching for evidence they are rolling over again. The key is whether they do so before they reach the July highs and then the May highs. 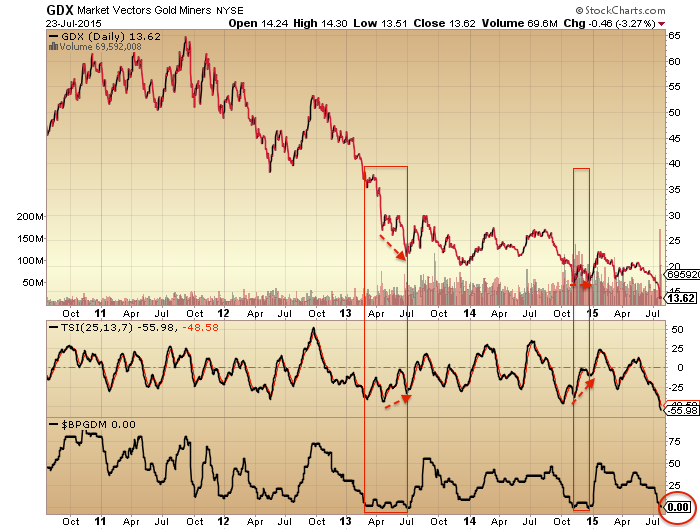 At the same time I am looking for a lower low in gold and miners on positive divergence. That extreme reading in capitulative breadth may support this occurring, so have to stay open minded. Hence the importance of watching indicators and price for evidence of a roll over before the July highs, then the May highs. A bounce looks likely here, and a significant one at that. In the past, they typically occurred after major falls, but October last year and now have been more shallow. The Dow fell yesterday to just 3% off its July peak or 5% off its May peak. 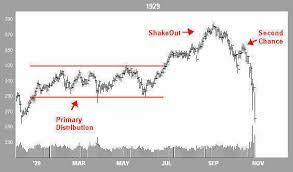 Capitulative breadth is made up of a count of large cap stocks in the index showing capitulative selling. Quite why this has occurred after only shallow nominal price falls is unclear. 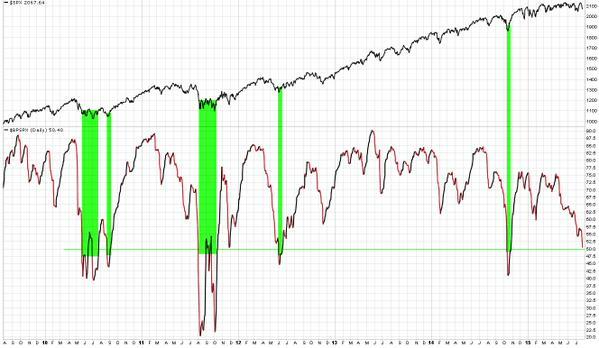 Also, bullish percent (SPX) reached a level suggestive of a low. Plus, CPC on Friday hit an extreme also only seen at previous lows, and the recent little cluster of such readings further points to a significant bounce. Draw it all together and it looks like the Dow (and other indices) is going to get a decent bounce here at long term rising support. 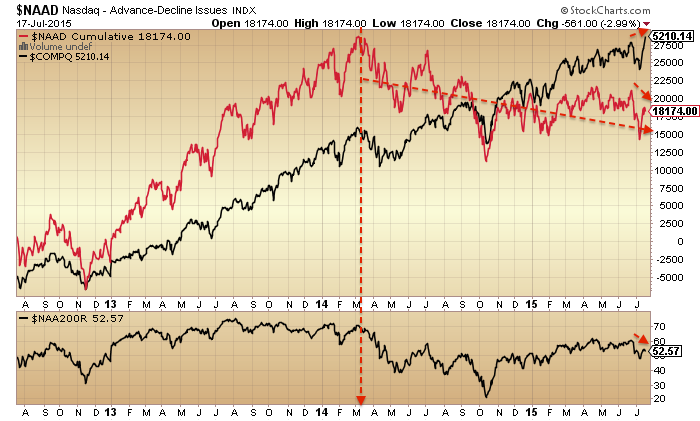 But note the norm in the past was for a lower low on positive divergence before a true bounce. 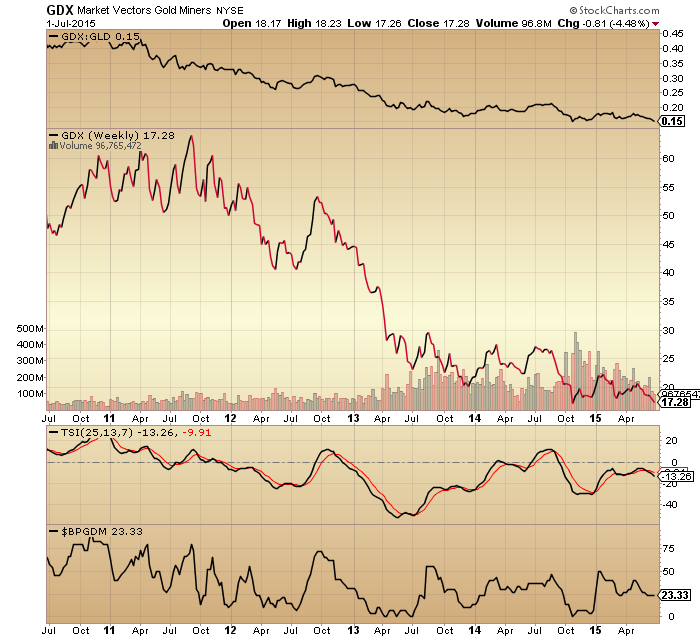 Therefore, it appears likely we will see a rally back upwards in broad stocks imminently whilst gold miners go on to form a lower low on positive divergence. 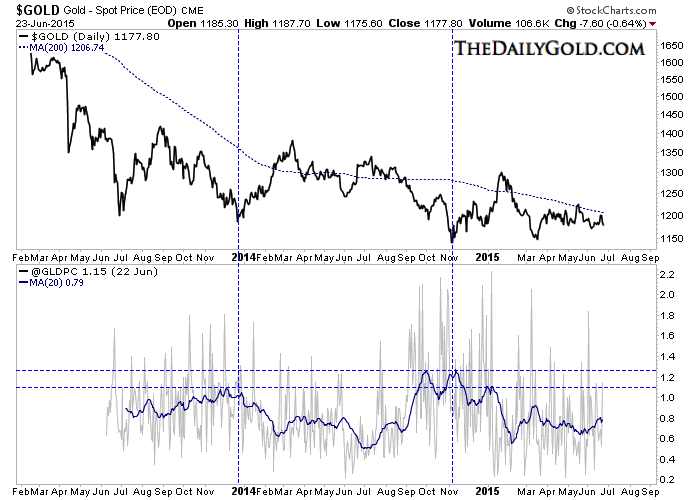 The bigger picture of a major top in equities and a major bottom in gold remains unchanged. The underlying picture still looks the same. 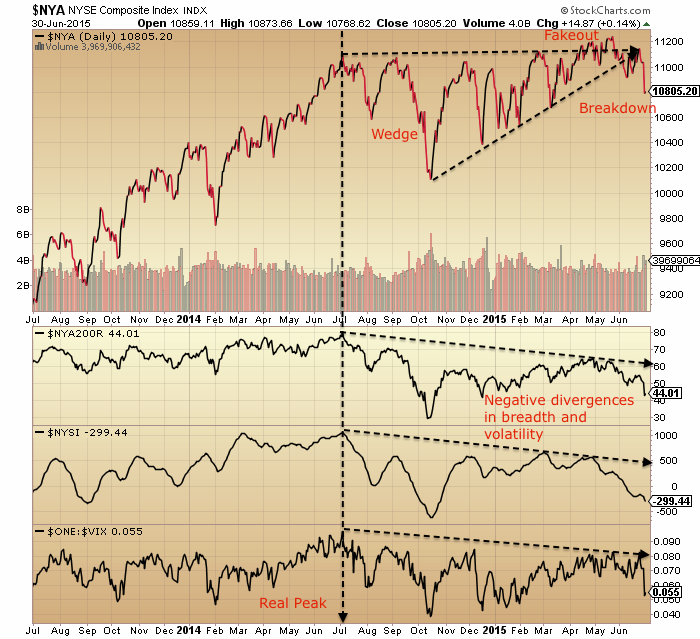 Stocks have rallied back up but there are so many persistent divergences that aren’t supportive. 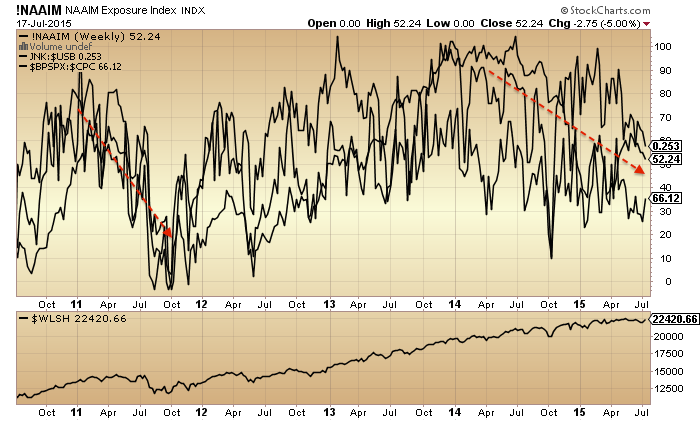 Here breadth, strength and bullish percent all look like the last gasps in 2011. The Nasdaq has outperformed the other indices to make new highs with the rally back up, but breadth is flagging a clear warning. Really, there are so many divergent indicators on US stocks it’s take your pick. 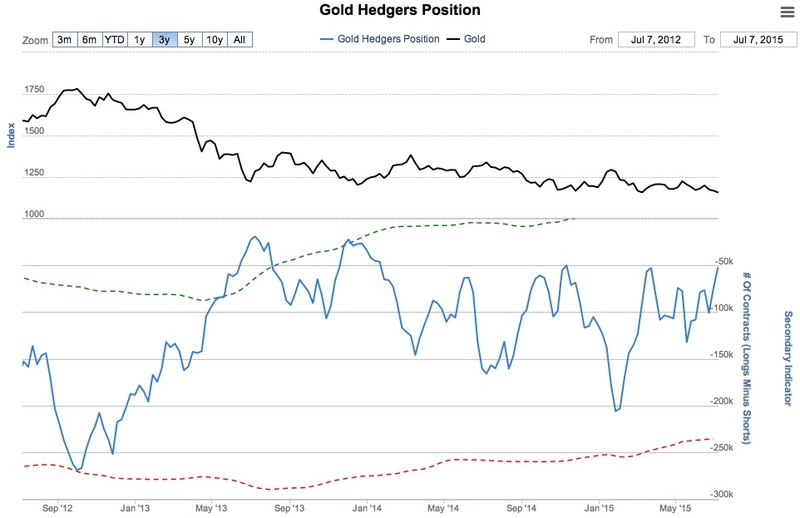 Meanwhile, gold dropped again but the picture is the reverse, with sentiment and positioning at contrarian levels suggestive of a bottom. Therefore, not much expansion needed. We are through the new moon and moving beyond the seasonal geomagnetic peak, and all the indicators are calling time (namely, major reversals in both classes). So just watching for the turn again to resume the attack and that should be the final move. Some big moves in commodities, China stocks, Japan, and a change in character in US equities whereby nothing is currently working for the bulls. It begs the question where we are in the topping process, specifically is the market going to fall apart from here, or do we yet get another rally back up to a lower high. 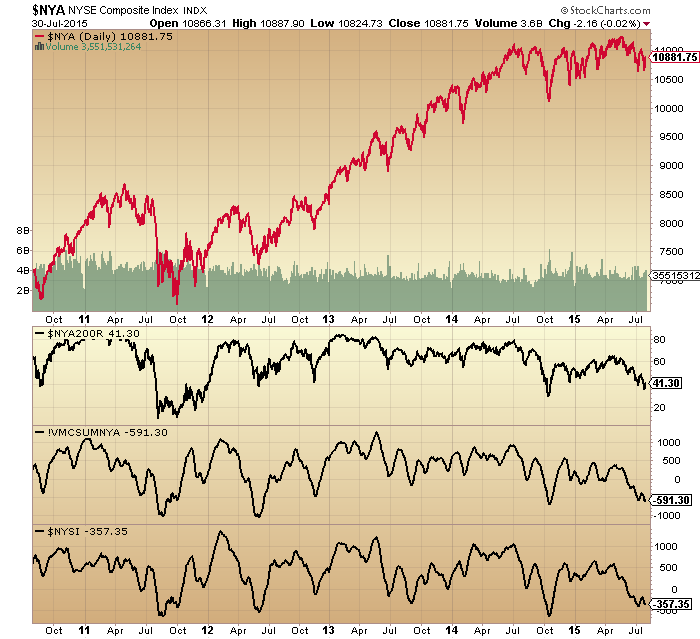 Junk bonds, oil and financial conditions all peaked out then too. 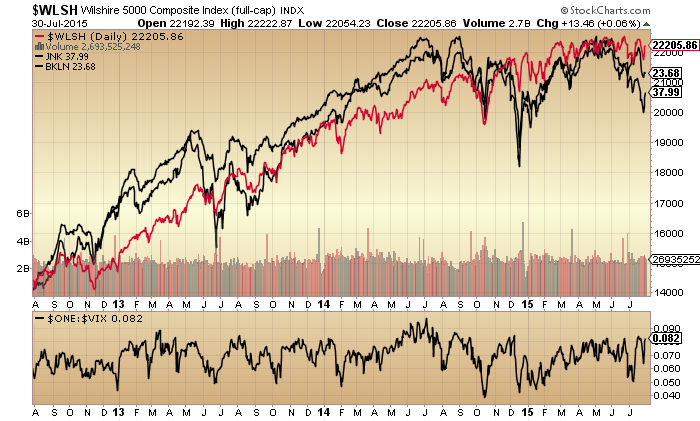 The second peak in nominal equities was May 2015, making for a 10 month topping process. 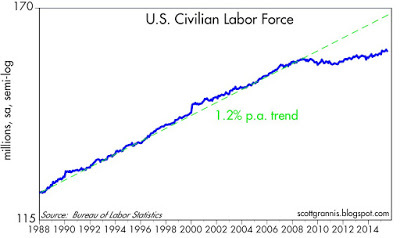 That’s not dissimilar in duration to 2000 and 2007. 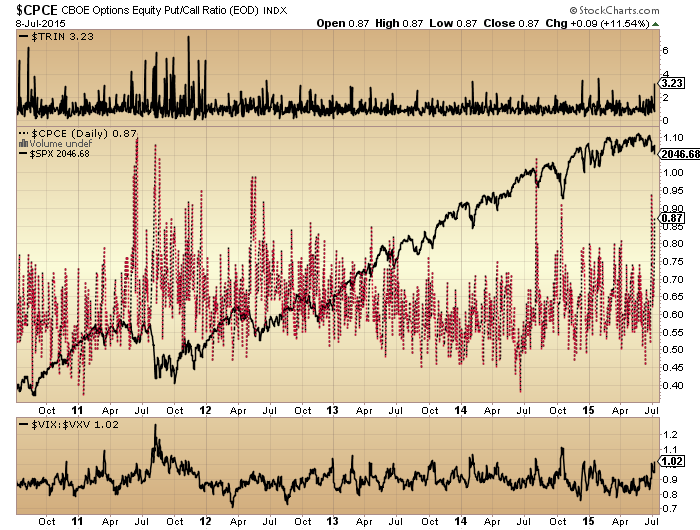 If we look at near term clues, the triple confluence of spikes in CPCE, Trin and Vix:Vxv to current levels (specifically all three together) hasn’t been seen since the breakdown in 2011. 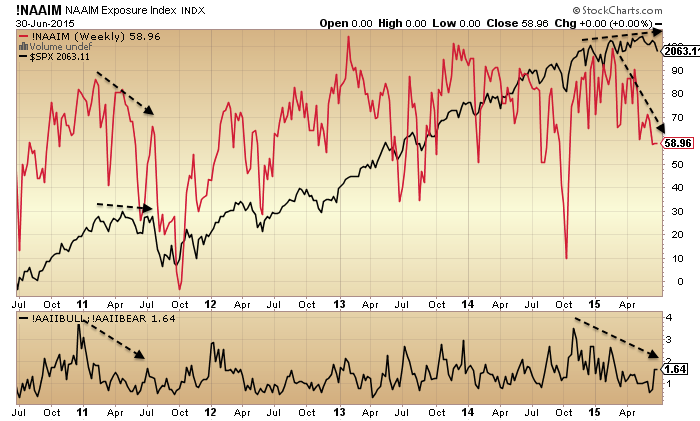 Their spiking could represent a near term low for equities, from which they get a decent bounce now. Or, they could represent the first stage of a large fear move, like in 2011. 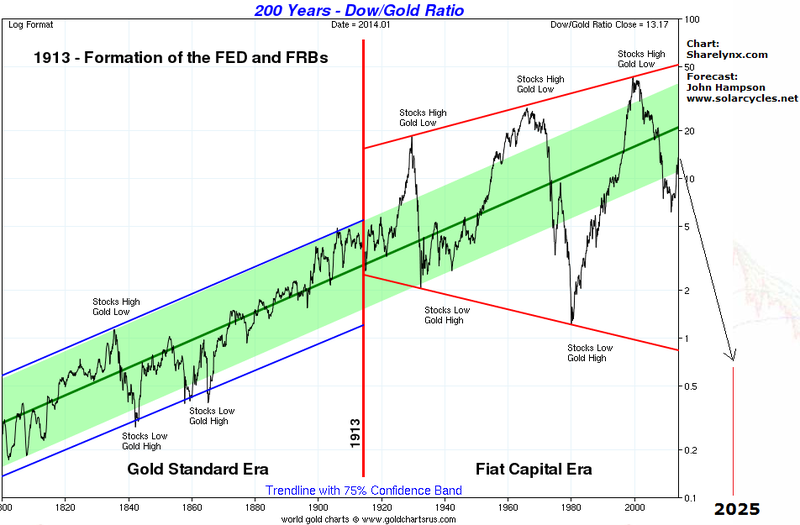 Right now the SP500 is just 4% off its high, whilst in 2011 it made a 19% correction. 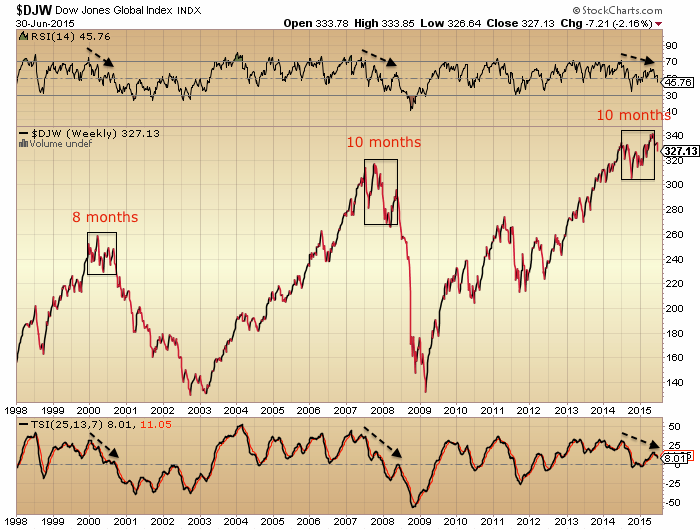 If we look at the bigger picture, all major indices around the world are now off their highs, most topping out in May or June. Is this about news out of Greece and China? They are providing a narrative for short term buffeting, but we can see equities have been in a typical topping process for a year. The under the hood peak was around last year’s solar max, as it was in 2000. Then as now stocks continued to levitate for several months following, whilst internals deteriorated, and the writing was on the wall. We know that allocations, sentiment, valuations and leverage have all been at saturation levels for some time. 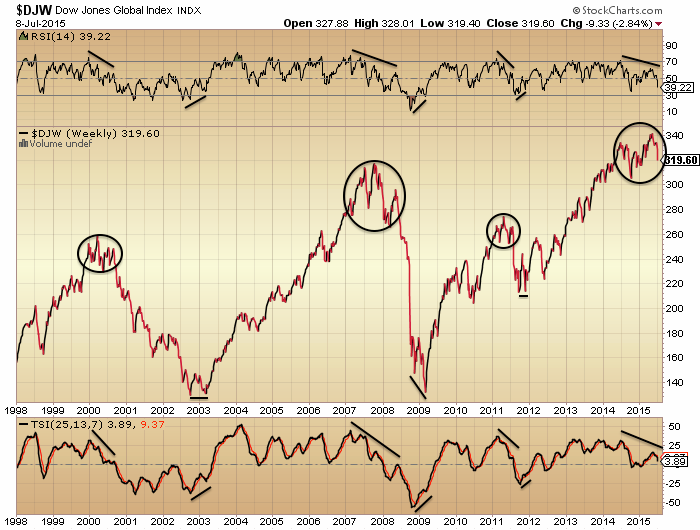 I suggest that the worries about Greece and China have initiated a trickle of bulls over to the bear camp. 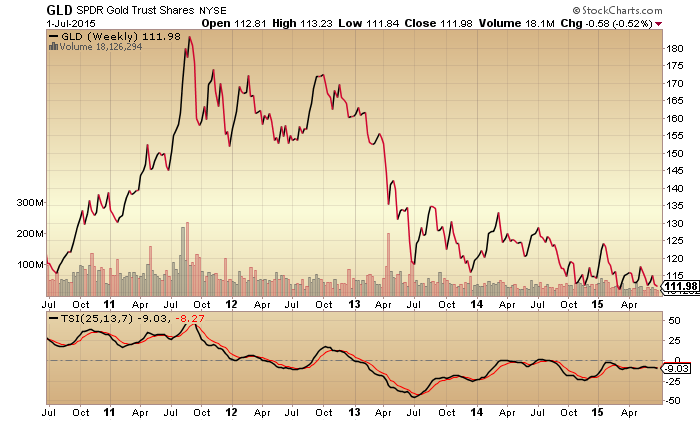 At some point this will become a rush and that’s when panic selling will make for swift, harsh falls. 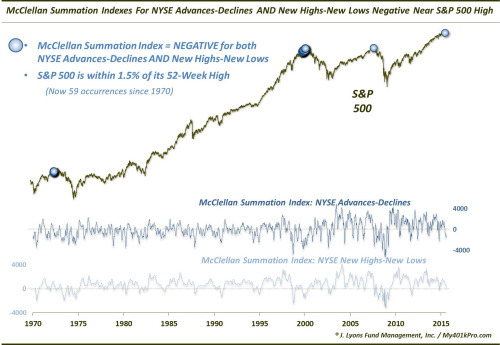 If you don’t believe that, then this will be the first time from such levels of leverage, valuations, sentiment and allocations that we don’t see a crash period averaging around 6 weeks taking around 35% off stock prices. If we think of it as less of a roadmap and more of similar waves of crowd psychology playing out, it’s the ‘second chance’ which is my focus, namely are we though that or is it still to come? If we are through it, then the market ought to quickly fall apart here, with any up days quickly engulfed. That’s kind of what we have been seeing the last 2 weeks. 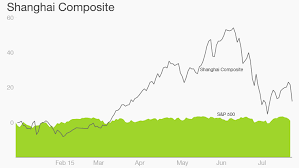 Plus, the heavy falls in China and commodities could be the initation of wider heavy falls. On the flip side, those spikes in near term indicators could provide a bottom here for stocks from which to rally back up into mid or late July, making a second chance peak ahead. So what am I doing? Attacking but with stops (short Dow, RUT, IBB, long gold). If we are post second chance then there is no time to lose. 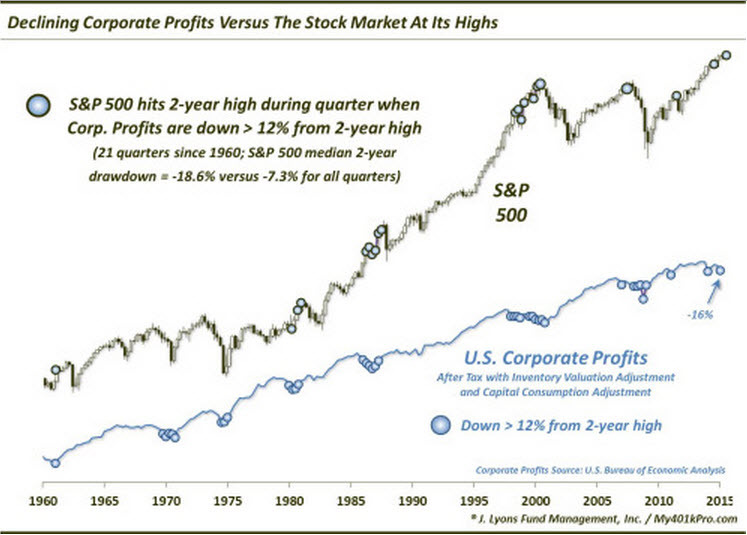 The stock market should rapidly fall apart with increasingly big lurches downwards. On the other hand, if we have a second chance rally back up, I don’t want to be too exposed and save my big positioning for a little longer. 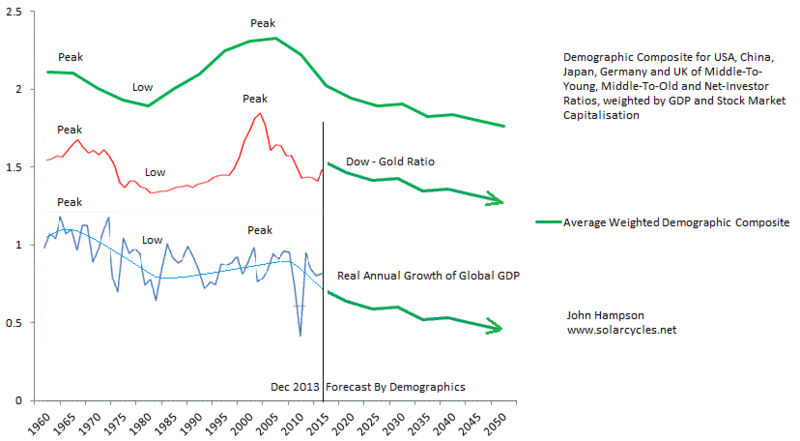 Lastly, might all this be way off and we are still safely in a bull market? 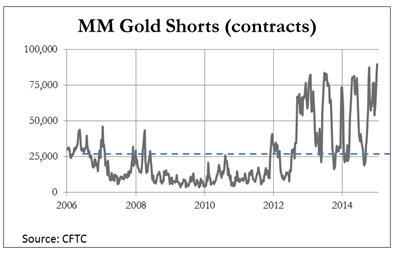 Well, financial conditions just turned negative. The Ted spread is now higher than it was when stocks tanked in 2011. US economic surprises are still negative and ECRI leading indicators are flirting with zero. Earnings season starts this week with predicted 4.5% yoy falls in both earnings and revenues. 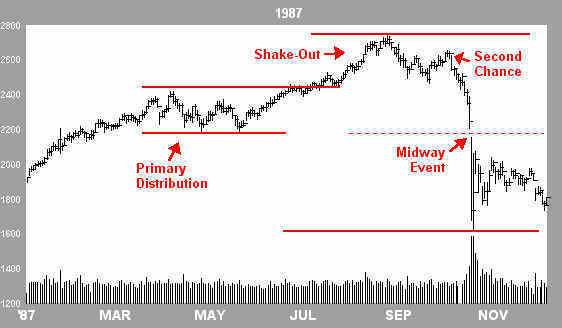 With sentiment, allocations, valuations and leverage so extreme for such a prolonged period now, even a safe bull market is more likely to see a sharp correction here, something like 1987 or 2011. But I don’t believe that: the case is much stronger for a fully fledged bear market, within which Biotech retraces its whole move of the last 2.5 years. It’s a picture of a major market top. The ‘real’ peak was mid-2014 at the solar max, as it was at the last solar max of Spring 2000. The supports for price since mid-2014 have been dismantled and evidence suggests the nominal price peak in equities occurred May 2015. Annotated, so no further comments.